What Day Of The Week Is September 28? 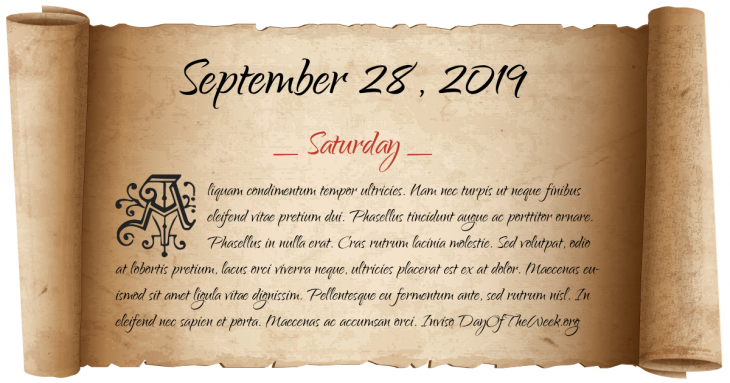 September 28, 2019 is the 271st day of the year 2019 in the Gregorian calendar. There are 94 days remaining until the end of the year. The day of the week is Saturday. Roman usurper Procopius bribes two legions passing by Constantinople, and proclaims himself Roman emperor. The newly completed United States Constitution is voted on by the U.S. Congress to be sent to the state legislatures for approval. Nazi Germany and the Soviet Union agree on a division of Poland after their invasion during World War II. Soviet Army troops liberate Klooga concentration camp in Klooga, Estonia. A military coup in Damascus effectively ends the United Arab Republic, the union between Egypt and Syria. The ITT Building in New York City is bombed in protest at ITT’s alleged involvement in the September 11, 1973 coup d'état in Chile. The military junta leading Guinea, headed by Captain Moussa Dadis Camara, raped, killed and wounded protesters during a protest rally in a stadium called Stade du 28 Septembre. Who were born on September 28?